State-of-the-Art has finally caught up with Construction Management Systems. Handheld devices that require special programming while hot synching, downloading and uploading, to synchronize with your home office accounting and job costing system, are now part of communications history; much like the Pony Express and the Telegraph. 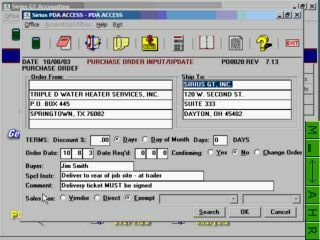 Imagine being able to enter timesheets, purchase orders, work orders, review job cost reports, etc. 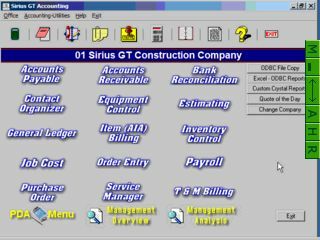 from the job site or any remote location directly to your home office Sirius GT© for Windows Accounting & Job Costing System. Sirius GT© has brought together the latest wireless communication devices along with a high speed internet server utilizing Expert City's PocketView® technology to give every contractor what they have long waited for - the ability to easily access and update information to the office directly from the field. 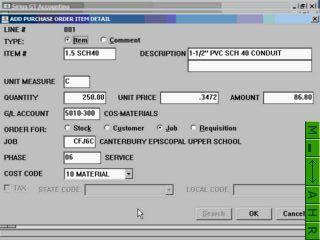 Enter change orders, purchase orders, time sheets, job-site notes, work orders and virtually anything that could be done from an office workstation can now be done remotely. 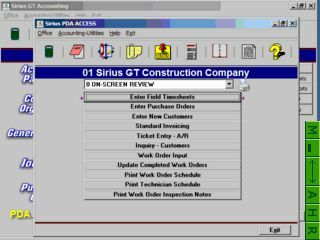 Sirius GT for Windows© has developed special menu features, that work with the smaller PDA screens, to allow input and viewing WITHOUT the need to scroll across menus. The built-in security features allow you to easily customize a unique PDA menu for each field person, so that only those functions that you choose can be performed remotely.